In early 2012, people concerned with native-title issues gathered at Matagarup on Heirisson Island to discuss Aboriginal sovereignty and native-title negotiations. Setting Up the Nyoongar Tent Embassy: A Report on Perth Media explores media coverage of the Nyoongar Tent Embassy's establishment and the sometimes violent actions taken by state authorities to eradicate it. The book reveals the ways in which Perth news media reports on these events routinely criminalised the actions of Tent Embassy participants at the expense of reporting on key issues of Aboriginal sovereignty and the members' peaceful affirmation of native title. 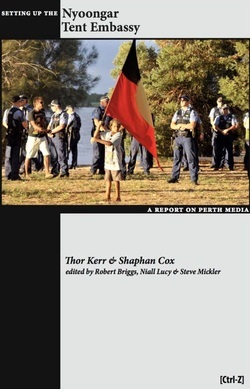 In its exposure of how reporting practices both legitimised and encouraged a violent state response to the Nyoongar 'protest camp', Setting Up the Tent Embassy offers both analysis of the Perth news media's treatment of the Nyoongar Tent Embassy participants as well as insights into media representation of Indigenous issues more generally. Setting Up the Nyoongar Tent Embassy is published by Ctrl-Z Press and available for free download from www.ctrl-z.net.au.